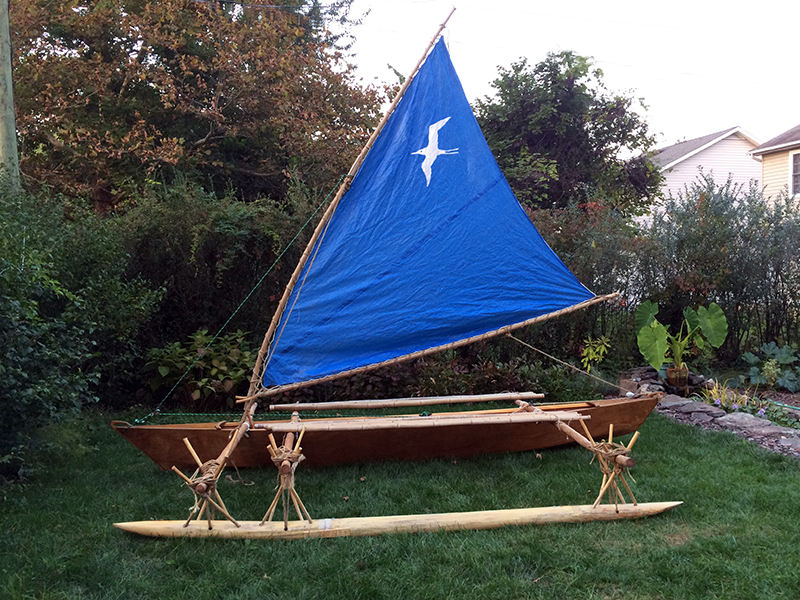 All I knew for canoe building was what I had learned building Namakaiwa, a sixteen-foot sailing outrigger based on James Wharram's Melanesia design. I have written extensively about that here. 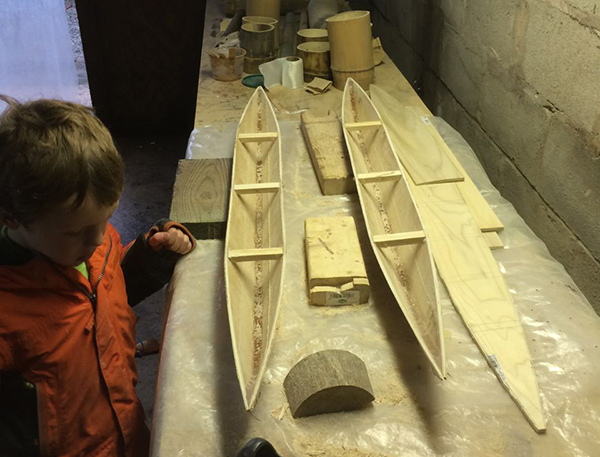 I'm not otherwise an experienced boat builder, much less a model builder, so I knew this was going to be a challenge. But I could see the finished product in my mind's eye. The only problem was that I did not have a set of instructions as I did for Namakaiwa. I had to figure out each step as I went along, and initially, this was without much firsthand knowledge or detailed photographs of Hokulea to work with. 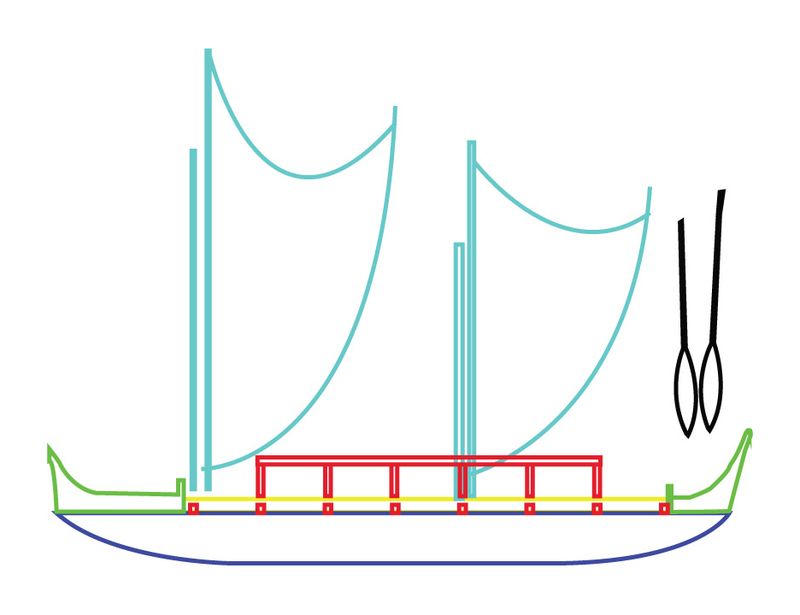 I knew from Herb Kane's diagram that the hulls were heart-shaped, and I struggled with how to do that with plywood. I was not about to take up strip-planking. The plywood did not respond to being bent like that, so I went with straight hulls like on Makalii. 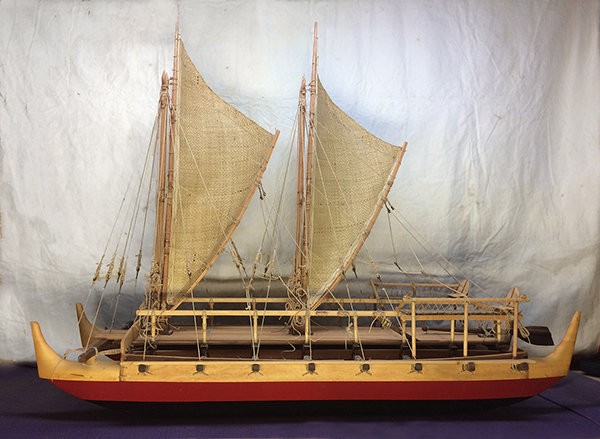 The idea, at least initially, was to have a generic model voyaging canoe, not a model of Hokulea. But that changed later. I bought super-thin plywood panels at the hardware store and, using a four-foot blow-up of Herb's diagram, cut out and stitch-and-glued the hulls. Then I fiberglassed the seam and epoxied for extra strength. The stitched and epoxied hulls, 2013. I had originally intended to leave the wood bare, but the ends of the wires from the stitch-and-glue process were unattractive, so following Hokulea, I painted the hulls black and red. 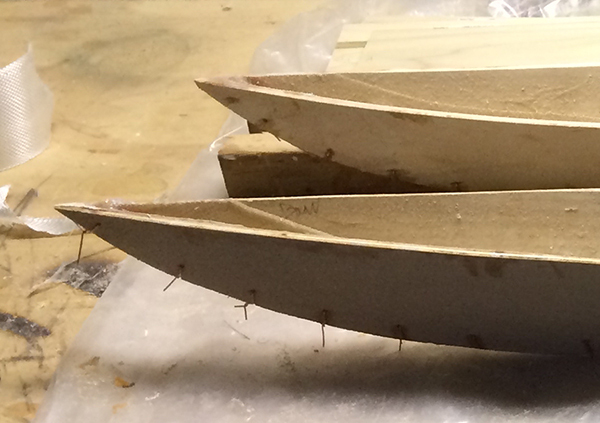 Close-up of the stitched-and-glued hulls, showing the wires used to pull the two pieces of plywood together. These are cut off, but their ends still show. On the big canoe, that didn't matter, but on this one, it was too obvious. For the hull deck material, I chose to use poplar. There are not many options for small-milled lumber at Lowes, where I shop. Pine, poplar and oak are about it, maybe aspen. I liked the poplar, and it came in sizes I could use easily, but not in 4 foot long sections. So I had to epoxy two 2-foot pieces together for each of the hull's decks, using a support piece underneath—which I had to make sure was not the full span of the deck, because it had to fit inside the hull while the rest of the deck had to sit atop the hull. You can see the decking pieces next to the hulls. This is before I glued them together. That's my son Holden in the photo, aged five at the time.